First of all, I have no idea why there isn’t a standard name for octagonal softboxes, every company uses their own name – Elinchrom Octa, Photoflex Octodome, Hensel Octaform… it gets confusing! That said the Octagon shaped soft-box is one of my favorite light modifiers. Not only does it make for beautiful catchlights it also wraps around the face and body in a way other soft boxes just can’t seem to pull off. I wanted to get a new one but I couldn’t really find any good reviews on the differences between brands, so I asked B&H to send me a couple to take for a test drive, thanks so much! A few days later they arrived and the match was set! I’m not a professional reviewer so I set out to simply experiment with both softboxes and report on which one I liked best. I selected the Photoflex for the very simple reason that Photoflex soft-boxes have speed-rings that will adapt them to several different brands of strobes and I chose Elinchrom because that is the brand of strobe I currently use in my studio. For this particular test I used the Elinchrom Style 600RX. In order to keep the results between the two soft-boxes as fair as possible I used the same settings on the strobe without moving the light stand at all between shots, I also kept all the camera settings exactly the same. I had Bailey (the beautiful model) try to hold the same pose between shots. We did this a few times with slightly different styles to get as broad of results as possible. I didn’t have any expectations going into it, I have used Elinchrom and Photoflex soft boxes and have had great success with both brands. What I found out surprised me. 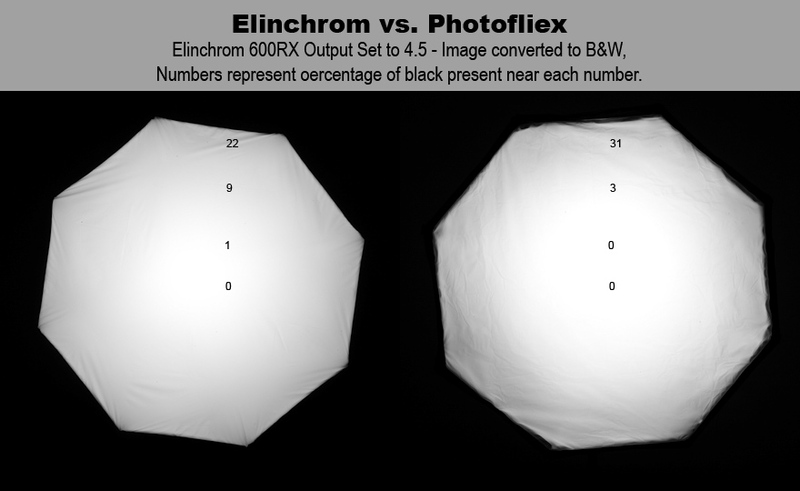 Photoflex comes with a lot more stuff, but Elinchrom’s design eliminates the need for a lot of the extras. 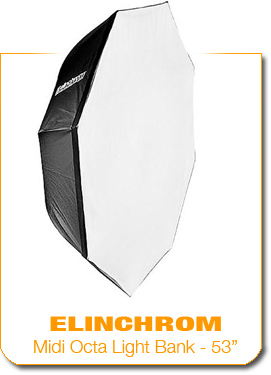 For instance, the octagon shaped cover for the back of the softbox isn’t needed by Elinchrome simply because the design of the softbox fits perfectly snug with the Elinchrom strobe. This may be because Photoflex is designing their light for maximum compatibility across multiple brands of strobes. The double sided lining that comes with the Photoflex box is kind of a cool idea. Why you would use a gold reflector? Well if you ever shoot in the shade on a bright sunny day you’ll notice that there is a blue-ish color cast. The reason you get a blue color cast is because the ambient light is blue – mainly because it comes from the blue sky. Since gold is a yellowish color (yellow is opposite Blue on the RGB color wheel) the gold reflector can help correct the blue cast in shadows. If you’re shooting the octa mostly inside a studio (like I am) then the gold reflector is pretty much useless… it is cool to have but it’s also a little bit of a pain to put on. The texture of the two inner linings is significantly different, the Elinchrom has a raised, pebble like texture that you can see and feel. 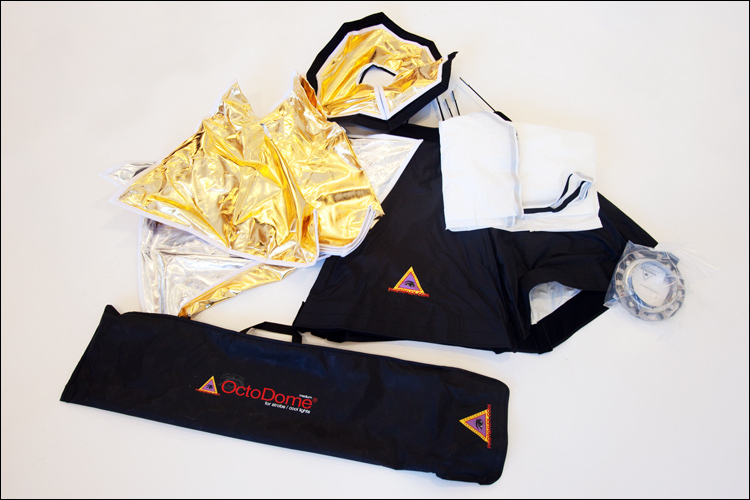 The Photoflex lining is completely flat (both gold and silver). I’m interested to see if this has any affect on the final images. Also, the baffles are made out of markedly different material. 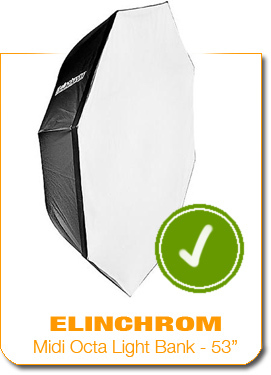 The Elinchrom material feels more cloth-like whereas the Photoflex baffle feels more plasticky. The cases don’t really affect how they’ll shoot but it’s worth mentioning that the Elinchrom case is much cooler and better quality. I hate putting together softboxes, especially big ones. It’s a hassle. As far as hassles go the Photoflex was much less stressful putting together, even though I had to put on all the linings the built in tent poles were much easier to manage during set-up. It’s a trade-off though, once finished the Elinchrom had a smoother front to it, all the edges were crisp, it was much, much lighter, and the back of the softbox fit snuggly to the light which eliminated all the nasty spill light. Also, the Elinchrom has zero velcro on it and the Photoflex feels like it was born in a velcro factory. 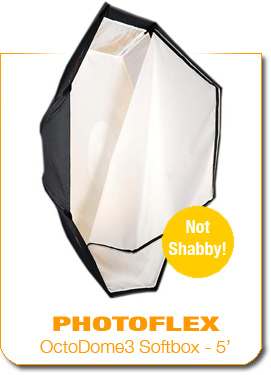 The Photflex does sell a mesh grid which fits the front of the softbox. 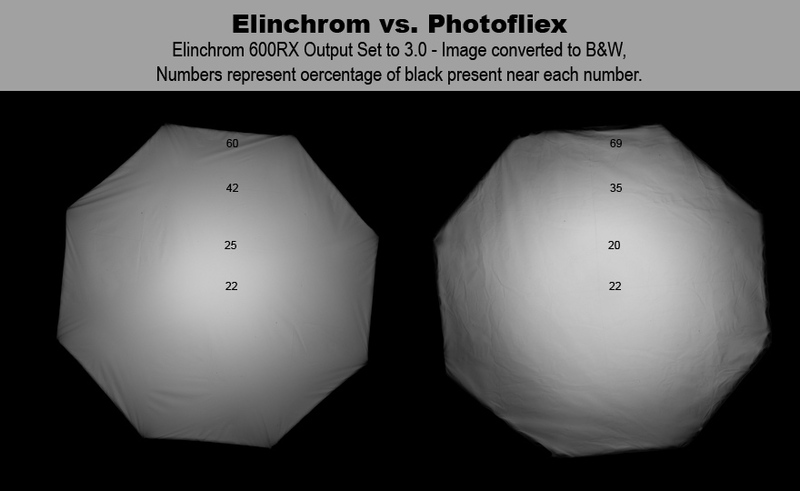 An equivalent option is not available from Elinchrom. For this review I both soft boxes without a grid the entire time, I’ll do a separate review on the mesh grid in a later post. All-in-all, if I were choosing soft-box that I was going to take apart and put back together often I’d probably go with the Photoflex, though if I had the option to leave it constructed most of the time (which I do) then the Elinchrom’s light weight and more solid construction make it a bit more convenient moving around the studio. On first glance many of you will notice one difference between the two images, the Photoflex seems to be brighter – especially near the center of the image (right around the middle of her face). 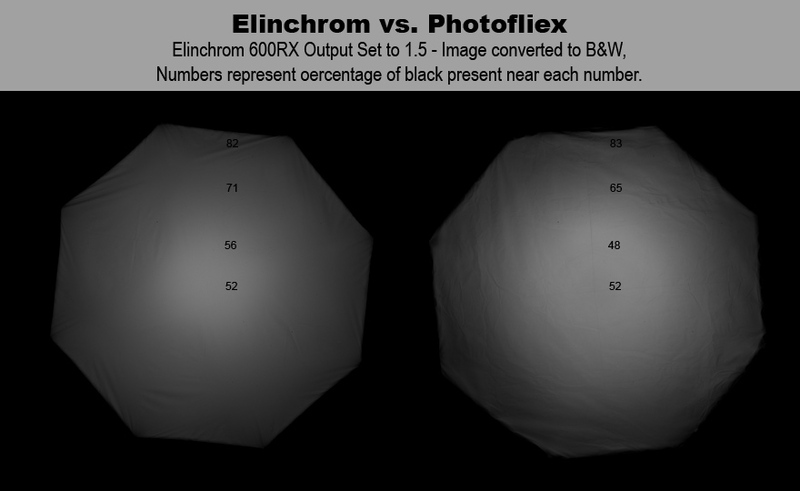 I think the brightness has to do with the different fabric on each of the softboxes, the Elinchrom’s cloth baffle simply disperses or absorbs the light more than the Photflex. Brightness aside the Photoflex seems to be a more specular light source than the Elinchrom. Specular vs. diffuse is one of the main principles in the quality of light and generally speaking the smaller the light source the more specular it is, and the more specular a light source is the harder the shadows and highlights are. That’s why an overcast sky (the biggest light source of all) creates nearly zero shadows. 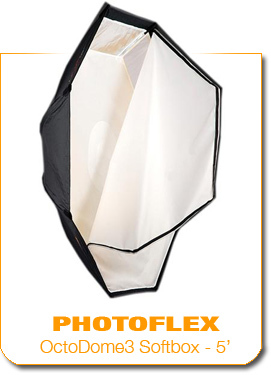 What’s confusing to me is that since the Photoflex soft box is bigger it should be putting out a more diffuse light, but that’s not what is happening. It’s a very, very subtle difference though, so we’ll take a closer look at what I’m talking about. Look at the shadows just below her cheekbone on each of these completely un-retouched images. Notice how the edge of the shadow on the Photoflex is just a tad bit more defined than the edge of the Elinchrom? I’m not talking about darkness of shadow, I’m talking about the edge where it transitions from shadow to light. You may need to squint to see it but you’ll notice that the bottom edge of the Elinchrom is very soft, whereas the Photoflex is a little more defined. This is the exact opposite result of what I would have expected since Photoflex should be the more diffuse light source. I’m not saying that a more diffuse shadow is better in any way. Many jobs call for more defined shadows, in which case a more specular light source is ideal, but a 5′ foot octagon softbox is designed to modify a light into a diffuse source. Certainly this difference is not a major one at all, though it is noticeable to me. Also, the Elinchrom seems to have slightly yellow color cast to it, again, easily corrected before or after I took the shot – but I wanted these to be with identical settings. I think both would be an excellent choice for a beauty headshot. I do prefer the Elinchrom mainly because of the subtle hot spot from Photoflex in the center of the image. Again, the Photoflex appears brighter overall. Both create very useable results. It was only after very careful observation that I realized something really strange. It has to do with the light hitting the model’s left thigh. On careful inspection (you have to look at how well the light reflects off the top of the thigh) you’ll notice that the light on the Elinchrom image is brighter than the Photoflex image. Which is strange for a couple of reasons, first of all the Photoflex softbox is larger so her leg should be closer to the light source, and the closer the subject is to a fixed intensity light source the brighter that light will appear. Of course spreading the same amount of light across more surface area would definitely decrease the intensity slightly but we already know the Photoflex is producing brighter images overall. Maybe it was just because her leg is bent slightly more towards the light-source in the Elinchrom version – that would definitely cause a brighter light… but I don’t think the difference would be this much. I could absolutely be wrong though, I decided to do another experiment to find out. Like any 5th grade science teacher will tell you, in order to create a successful experiment you need to develop a hypothesis and then create an experiment to test your hypothesis. After converting these images to black and white I used the eyedropper tool along with the info tab in photoshop to measure the amount of black present at similar points in both lights. I labeled each of these as seen above. This test verifies my theory and explains both issues I was having with the Photoflex soft box, there is a ring of more intense light (with a darker center) in the center of the Photoflex softbox and as the light goes out it stays brighter for longer but then drops off much faster than the Elinchrom. Even though the Photoflex appears brighter throughout the entire image you can see that the transition from the tones in her face to the tones in her legs is more drastic than in the Elinchrom version. Not much, but when I look for it I can definitely tell. Of course I could have shot still images of cubes and cylinders for this light test and we could have eliminated the tiny movements of the model in between tests but overall I think the best kind of test is a real life one. That makes the beautiful Bailey a perfect choice for this experiment and I would like to thank her for her patience while I yelled at her to hold still while I swapped out lights. All in all both, of the soft boxes performed well. If I’m being honest I prefer the Elinchrom. Not only does the light transition more smoothly (with a less-pronounce center hot-spot) but the lighter weight and tighter construction makes it something that is just easier to move around in the studio. One big complaint about Elinchrom though – I’d really love it if the Elinchrom softboxes weren’t nearly IMPOSSIBLE to remove from the Elinchrom 600RX! However, it needs to be said that I am certain I could get very useable results from the Photoflex. great review. i love shooting with rotalux light modifiers from Elinchrom. my personal fave is the deep octa without the front diffuser which for me is my portable 30″ beauty dish. I really love how easy they are to set up and tear down. Excellent review! Such an unbiased perspective…I found it informative and very useful as I’m making decisions on a upcoming Octabox purchase. BTW, absolutely love your work! Kim – As per your suggestion I just requested the deep octa for a review! I’m thinking I’ll do a with and without baffle comparison and post the results. You sir, are a genious! A scientist, artist, and alchemist of light… You should start doing reviews professionally for products and websites! Thanks everyone! Mark – I plan on doing more reviews… if you have any requests let me know! Great review; thanks. In looking at the images the skin tones seem to be smoother on Elinchrom’s Rotalux softboxes then on the PhotoFlex softbox. One thing to consider is that every manufacturer optimizes their modifiers for their own equipment based on the distance from the flash tube to the back plane of the light, as well as the curvature of the back plane of the light. So Elinchrom modifiers tend to work better with Elinchrom strobes, and Profoto modifiers tend to work better with Profoto gear. As you pointed out, Photoflex tries to be everything to all srtobe manufacturers and may not deliver the exact same results. One thing you failed to mention is that once you’ve put the rods into the Elinchrom Rotalux, the design of their speed ring allows you to close the and open the box without removing the rods. This means that just about every Rotalux can be set up and torn down in 2 minutes making them terrific for location work. Also, if you want to include a gold, or for that matter silver, white or diffused look into a scene with Elinchrom strobes, you can you their deflector set which is easier to set up then panels in a softbox and helps maximize the light inside the box. Great points! The design of the Rotalux does allow you to leave the rods in the speed ring, which is nice, the frustration I’m having with take-down is Elinchrom’s spin/lock mechanism with the 600RX strobes is tough to manage since I have no access to the front of the strobe (because of Elinchrom’s design) I can’t hold the speed ring in place to prevent the whole ring from turning when I’m trying to twist the softbox to detach it from the strobe. Kind of tough to explain… but I hope that makes sense. I’ll have to look into the deflector set for the Elinchrom softboxes, I wasn’t aware they existed! I understand what the issue is. On the inside of the speed ring is a wing nut. Tightening the wing not inhibits ring rotation and is used to mount and unmount the box from the light head. When mounting, you can actually tighten the wind nut by reaching in through the ring itself, although I tend to tighten it during box construction. To unmount it simply lift one side of the outer diffuser, unclip one side of the inner diffuser (no Velcro to inhibit you from doing this) and tighten the wing nut. Then you’ll be able to unlock and twist off the softbox. Elinchrom’s deflector set is EL 26310. Perfect! Thanks for the tip Mark! Nice review but I kind of disagree on the specular highlights. Look at the first two pictures at her right shoulder. There is a diagonal highlight which is much softer from the Photoflex vs the Elinchrom. Maybe a hotter spot in the middle of the Photoflex with softer sides? Did you feather these or shoot them straight on? Very subtle movements in shoulder blades translate to much different shapes in the shoulder bones… so I wouldn’t place too much weight behind the highlights on her shoulders. Jake – thanks so much for the review! Really looking forward to your review on the Deep Octa as that is the next thing on my wishlist! Also looking forward to your comments on the deflectors! I made a fairly major purchase of elinchrom stuff recently, and the kind people at the Flash Centre (London) threw in a set for me! Unfortunately, they are still in the box, but I will be using them! Great review and much of help understanding differences between octas! Almost totally off topic, but I have troubles understanding your retouching decisions with one of the photos. I find your second last photo oddly darkened from the original. You darkened head and hair so that those don’t have any detail on shadows, just black, and the legs look too bright below the dress and too dark at the bottom – or at least it’s a huge contrast to original where legs have the opposite light and dark areas. Jan – you’re struggling with this because your photographer training is probably telling you that details in lights and shadows are very important to retain, and this is absolutely true. You want to expose an image so that it has plenty of details in the shadows and highlights, but the reason you want to do is so you have choices. What I mean by that is by making sure your exposure is accurate you have the choice to show that detail or not, if you don’t do your exposure right then that detail is gone – forever – you no longer have the choice. In this instance (and in many instances with my work) I expose for the shadow and highlight detail but I don’t pose the same limits on my creative decisions after the fact. If I decide I want a darker image and making a dark image means I push the shadows closer to deep black (there is still detail there by the way) then I allow that option… the finished print doesn’t always have to have a full set of gradual steps through each of the tonal ranges. That’s just not a rule I apply throughout my entire workflow, it allows for much more creativity that way! Jake, something that I’ve found to help the ring in the middle of the Photoflex Octabox is to use a speed ring from someone besides Photoflex. Their adapter ring for Elinchrom is much too deep. Light from the flash tube isn’t hitting the sides of the octabox near the center. Midwest Photo Exchange sells a ring that is much shallower, and if you flip the ring over in the mount from the way they sell the thing and the whole thing is even shallower. I think the brand is called Fomex, but I’m not sure about that. I’ve got another ring that is even shallower, I think it’s a Redwing or Chimera… but not sure about that as it was given to me used and it doesn’t have a brand on it. I wish I could buy an EL Octa Bank, but I bought kino flos… I’d love to mount my profotos into that big Octa Bank. I generally take lamp and octa off the stand, onto the ground. It’s much easier to get lamps off from there. Great review! Have you ever tried Profoto? I probably will get the Elichrom at the end. Thanks! I actually just reviewed the Profoto D1 Air strobe kit, the review will be available at http://www.shootforlove.com. Loved them! Thanks a lot! I am looking at it right now!!!! You are awesome! I feel compelled to chime in and defend Photroflex: the removable back panel of the Photoflex Octa is designed to allow heat to escape when using Tungsten or HMI lights, e.g. the Photoflex Starlite. Even a flash head with a thermally hot modeling light like the Profoto Compact 1200 needs ventilation to avoid overheating and shutting down your photoshoot. I’ve used lots of gear in my career, and Photoflex is among my favorite. Elinchrom Rotalux are indeed great for location, but I prefer using them with Profoto heads so that I may move the speedring fore and aft to shape the output of the light. I also highly recommend Photoflex scrim panels, they’re among the least expensive on the market and built to last. Thank you so much for your comments ! I would like to echo your sentiments, this review was after my first use and since then I’ve learned to appreciate photoflex octa’s so much more. 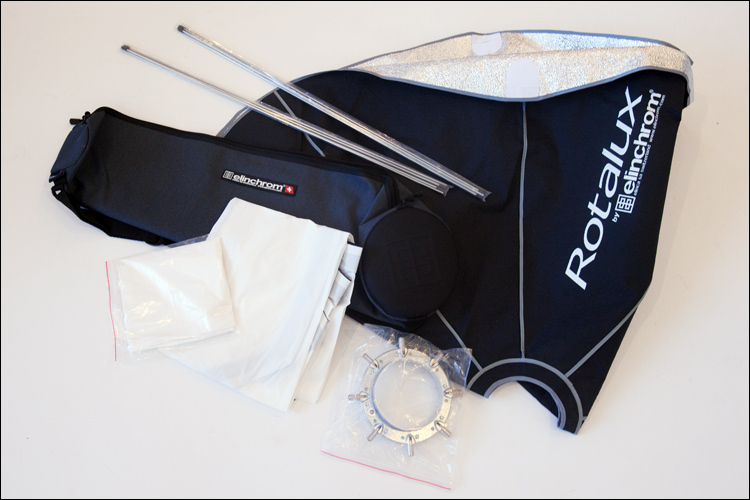 Your work is fabulous by the way, very stunning stuff… do you do reviews of the gear you use? If so I’d love to feature some!